Erin's Rhewsings: Book Tattoos -- FINALLY! So, it happened! FINALLY! 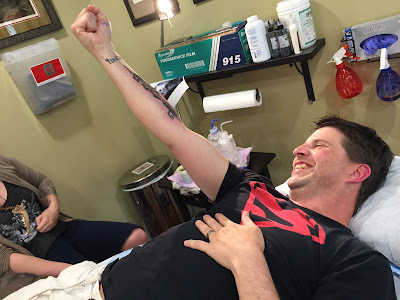 Deek and I got our long-awaited book tattoos, and I'm here to give you the scoop on it. I have been planning my book tattoo since 2013. I knew I wanted it to be the Vanguard symbol from my trilogy The Fulfillment Series. My friend and Dream Team member Danielle designed the symbol, and I loved it from the first moment she showed it to me. It's rich with meaning because Danielle spent hours and hours researching and creating the perfect blend of this and that to truly capture the Vanguards. For an explanation behind her choices for the Vanguard symbol, check out this post she wrote. But...I'm so glad I didn't get it in 2013 because my cover underwent a revamp from the lovely and supremely talented Anita from Race-Point! I knew I wanted to incorporate her design with the blue ball behind the symbol and the swishes of light surrounding it, much like you see here on my work computer (the hubs had this symbol made for my birthday--LOVE, LOVE, LOVE it!). Deek says he's been planning his book tattoo for almost as long as I have, but he had no idea what he wanted it to look like. 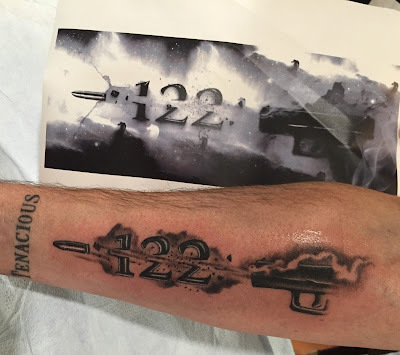 So, last year, we hired Anita to design him a tattoo that he could also use as a blog banner for his upcoming release 122 Rules (thanks for the Christmas money to do that, Deek's parents!). We gave her the idea for what we wanted, but our drawings were truly atrocious. I mean, they were THAT bad. LOL! Somehow, brilliant Anita took our scribbles and created a visual masterpiece. 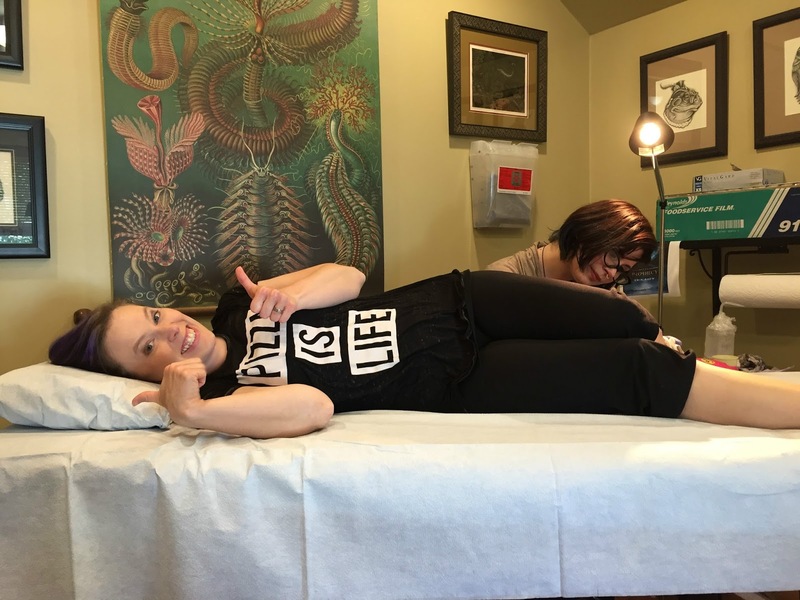 This past Saturday, we went up to the tattoo parlor to discuss our designs and ideas with our tattoo artist, Karla. She's one of the best y'all. If you're in the Pacific Northwest, look her up. She's award-winning and certainly deserving of it! 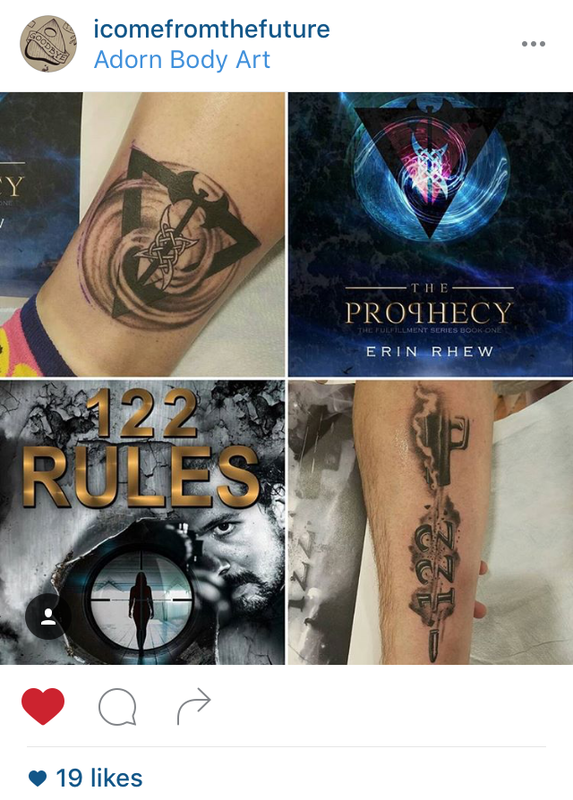 She said she could definitely make these images into amazing tattoos. But when we asked when she could book us, she said she was booked until mid-July. OMG! We won't even BE in the Pacific Northwest anymore by then! Karla had done all of our tattoos up to this point, and we didn't want anyone else to do them. Lo and behold, someone called to cancel and appointment while we waited. She looked up and said, "Can you be here Tuesday?" We were like, "Tuesday, Tuesday? As in 3 days from now?" She said we could have the whole day to ourselves, so we agreed. 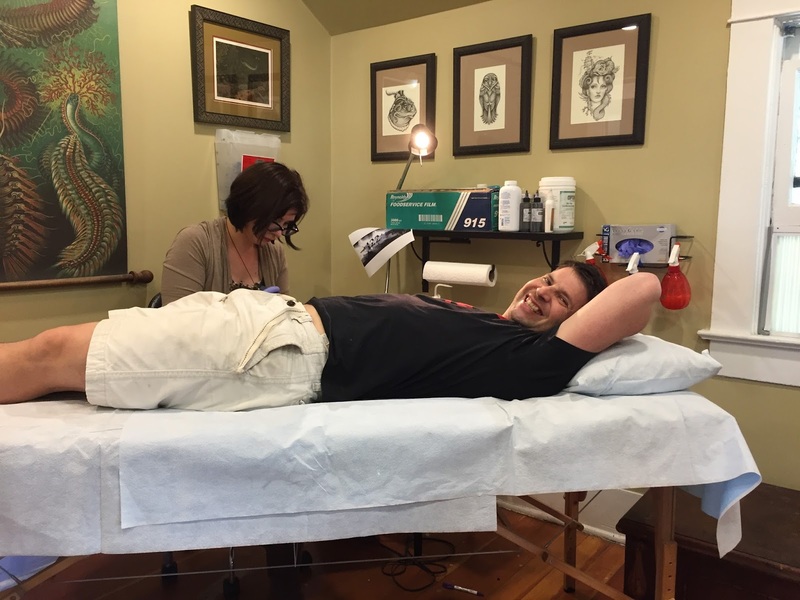 Deek took the day off from work, and we had a date at the tattoo parlor. LOL! We'd been planning to get these tattoos to celebrate the one year anniversary of our second, Southern wedding, so we just had that celebration about twenty days early! LOL! So, we headed to the tattoo parlor on Tuesday, ready to get our long-awaited book tattoos as well as a special message to one another on our shoulders. A whole day dedicated to repeated little bee stings. Nothing quite like that kind of celebration! LOL! After several hours, Deek got his turn. See Anita's design hanging from Karla's station? These tattoos were a group effort from two very talented ladies! 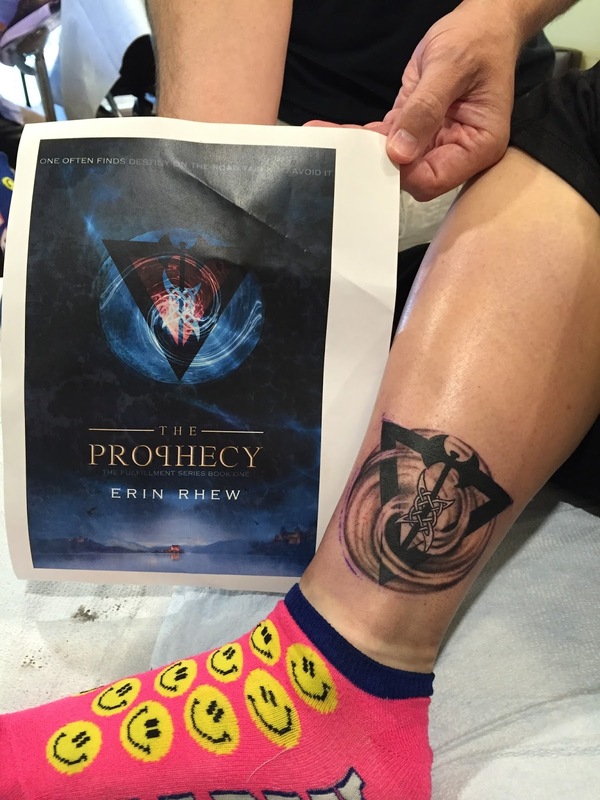 And we FINALLY have our long awaited book tattoos!!! I love how Karla incorporated the themes of Anita's work while adding her own artistic flare to it. The kick-bootae nature of the tattoo really goes well with my happy socks, don't ya think? Haha! Deek and I could not be more pleased with his as well. Same thing--Anita made an amazing drawing and Karla added her own interpretation. And we ended up with something inspiring! That night, Deek and I walked to have an early anniversary dinner at our favorite haunt (and to reward ourselves for enduring a whole day of pain--LOL). 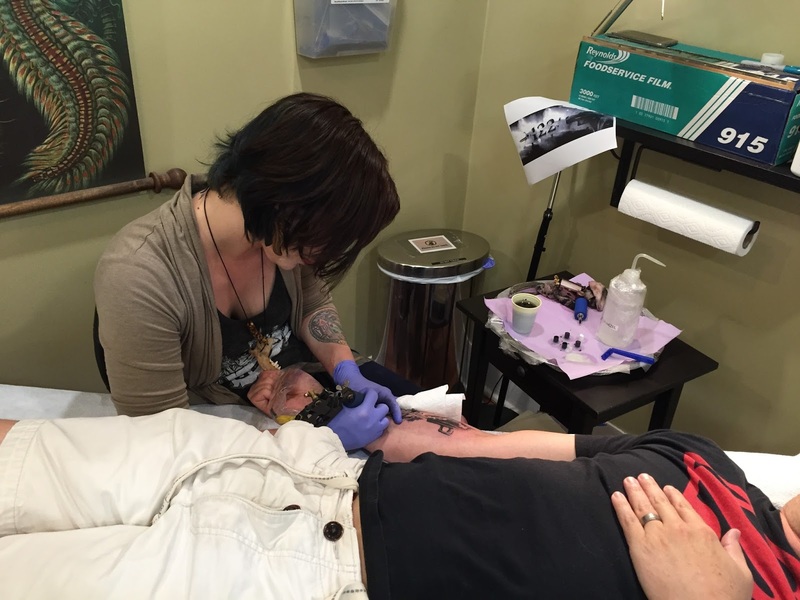 As he talked, he kept gesturing with his newly-tattooed arm, and every time he did, I thought how totally awesome it looked on him. What an amazing time I had with you my love! There are so many dreams coming true that I don't even know which way to turn. Our books are out and that's amazing, we have awesome ink and that's amazing too. But my life with you, my love with you, is beyond the most amazing thing I could have ever dreamed of. Thank you for the wonderful--early!--anniversary and for the wonderful life!